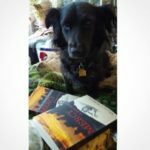 This is Alberta J McMorris… well, as she’s camera shy, this is her “portrait of the author as a border collie” which I love just simply because as authors we are commonly so camera shy but she found away around it. When did your, dare I say, fascination with vampires start? I think it really started after seeing the movie Twilight (I know I’ll probably get a lot of hate for this) but that film, more than the book, or anything else that had come before it, actually made me wonder if it was possible to write this type of character with a more “human” face than what has been done traditionally. I wanted to perhaps set these characters free from the literary restraints imposed on them. To me, if vampires were supposedly these powerful creatures that had been around for centuries, it would make perfect sense that they would have found ways to harvest human blood and to create a society where they could be out in the world. It took a few years before I felt like I needed to write anything and when the first character spoke to me from the page, it was the character Nico who first spoke to me & opened the floodgates for all the other characters who have since inhabited my brain. Faking it, Phoebe ( a novella set in NYC 1967 about a vampire who suddenly gets thrown into the spotlight of fame and has to fake her death – why NYC and why 1967? Why not 1967? I mean, vampires are immortal, so it makes sense that they would be around in the late 60s and what better time to be young and beautiful?. As far as I know, there weren’t too many other vampire stories set in that time, so I wanted to take a peek in at what it would be like for a character like Phoebe. I also have some stories set further back in the past. New York City in 1967 was an interesting time, politically and culturally. If vampires didn’t need to hide in the shadows, NYC would probably be the best place for them. You can walk down the street and not be noticed. There was also a large amount of drug use among young people in 1967, particularly speed. A sallow, gaunt complexion wouldn’t draw too much attention. Mercy, a love story; set in NYC 2017; a young woman has a chance encounter with an old man who isn’t what he appears to be and sets off on an obsessive quest to find out who he is, but also finds out something about herself in the process. It sounds like you believe in fate so let us know some examples of fate in your own life. I think that chance, rather than fate, is what brings Emily and Mathew together. In a place like NYC, where you can easily never see the same person again, to actually have that unforgettable meeting with someone that you are immediately drawn to is so random. Were it not for the bicycle nearly running her down on the sidewalk, she and he might have just passed each other and never seen each other again. I can think of a couple of examples of relationships where I’ve thought fate had played a part in my life but in hindsight It didn’t pan out as I had hoped. If anything, fate would have played more of a hand in breaking up those bad relationships rather than starting them. I think it’s best to always look forward. Life is full of many possibilities and you sell yourself short when you go looking for something specific. I’ve been writing something or other since I first learned how to hold a pen. I’ve dabbled in a few different styles, written a lot of bad poetry, and stopped writing altogether about ten years ago. This latest writing started in October 2016, it came on as a weird feeling that I needed to do something, but I had no idea what was coming, or the impact that this would have on my life. Who are your favourite authors/ books?Scott Fitzgerald- Great Gatsby has been a big inspiration to me. I don’t think there will ever be another party scene in a novel as vivid as the ones in Gatsby. Almost a century later and those characters still are as interesting as the day they were written. Jean-Paul Sartre- The Age of Reason. The opening quote in Mercy, a love story is taken from Age of Reason and my leading man, Mathew is sort-of based on the character Mathieu Delarue, a conflicted (and perhaps cowardly in some sense)protagonist. Louise Erdrich- Tracks, one of the best books I’ve ever read. Her stories are so rich with unforgettable characters and occasionally wander into the realm of supernatural. Absolutely one of my heroes. It seems like you have mastered the “elevator pitch”, tell us one about you as an author and share any tips you have for others who struggle with it. I still think of myself as a “new” author so I don’t really know what to compare it to, I write very organically – in the sense that my head is like a movie screen where I’m seeing these little films play out all day with various characters, scenes, and they don’t always make sense. I watch them over and over until something does make sense and then that is what ultimately makes it into the story. I’ve had dreams about characters, and a very strange dream where someone I don’t know came up to me and told me that one of my character (that I was having a hard time writing) was “stupid” and when I woke up I realized he was right. That character got taken out of the book the next day. You told me you’re writing two books currently – how do you balance your time and imagination between the two? Do you also read multiple books at once? I write as it comes. I was supposed to be working on Violet, the sequel to Mercy, and then this other book completely came out of nowhere with all these unfamiliar characters and needed to be written first. I’m working on that one now, and have put everything else on hold a bit. I have things written & mapped out. Each book has its own file; some more completed than others, and when I go to work on them I do have to refresh myself a bit and get reacquainted with the characters. Sometimes it’s good to let things sit for a while, and come back with fresh eyes. Some story that seemed really good six months ago may not stand the test of time. But it is difficult to manage time, I work full-time and sometimes just need to go stand on the beach to clear my head out for a few hours. You have some great book trailers available – tell me more about your process and success with those. I used an app called Scoompa Video to make the book trailers with enhanced photos and screen captions of some of my writing. I’m an amateur photographer and like to toy with different photo editing programs. You write under a pen name – tell us about the process of choosing that and the decision to write under that name instead of your given name. I felt that since I was effectively doing new work, I needed a fresh start. It is freeing in a way, because writing as someone else gives you the opportunity to leave behind your personal baggage or style or whatever may be hindering you in your work. Alberta J. McMorris didn’t exist before 2016, there was nobody to tell her that she was a “bad” writer, or that she can’t write novels and do this. It’s kind of like performing in drag, I can put on the Alberta costume and be a novelist because there was never any moment where Alberta didn’t think she wasn’t one. I’ve never really liked my own name that much either. Anything else you’d like to share about you or your process or your books? I hope that people like these characters and their stories. I think they have made a lasting impression on me and I hope that when people read them that they will feel connected to them. I had a strange experience last summer in an old house that I stayed in. It wasn’t a “scary” experience but it was something unexpected and worked its way into my writing. Thanks for letting me do this! Thank YOU Alberta, and readers of vampire tales. Be sure to go like Alberta’s Facebook and GoodReads page to show your support!